On a shelf next to the sand and water table I had what I called a set of hodgepodge and doohickies. Basically they were an assortment of materials and containers from which the children could choose to use in their operations at the sensory table. Though the materials and containers changed depending on whether there was sand or water in the table, a few things never changed. One of those things was a little pink plastic cup. Many of the items I set out on the shelves came from second-hand stores like Goodwill. However, I do not remember where I got the pink cup. For all I know, I could have inherited it from a teacher before me. I can say that the pink cup was not something I purposefully went looking for to add to the sensory table provisions on the shelf. I am sure I entertained the idea of getting rid of that lowly little cup. It is a good thing I did not because as tag my pictures, I keep seeing that pink cup everywhere. Not only does it pop up everywhere, but it is used in any number of ways by the children's in their operations. For instance, the children used the pink cup to fill other containers like a plastic ice cube tray (on the left). Or they simply used it to catch water (on the right). Axiom #6 on the right hand column of this blog states that children will try to stop the flow of any medium. 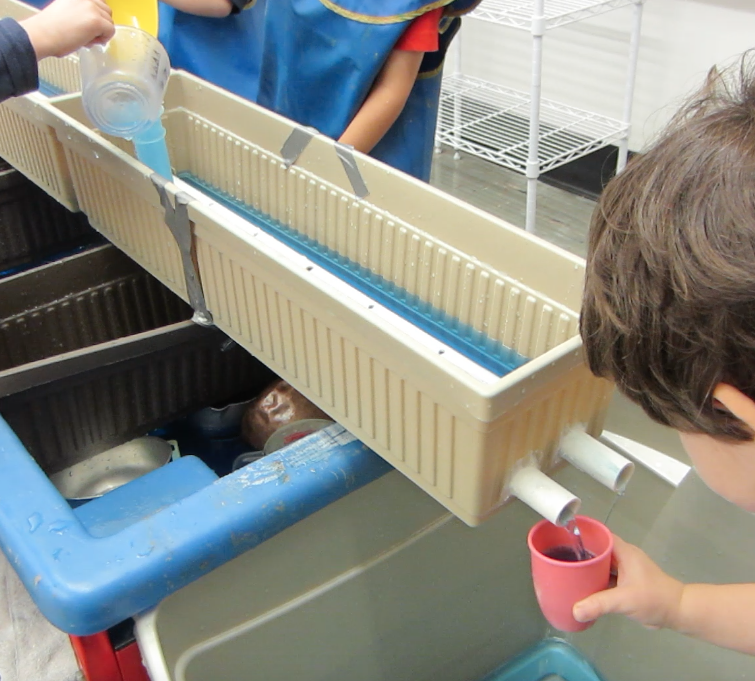 In the picture below the child found that the pink plastic cup fit nicely over the end of the PVC pipe, thus blocking the flow of water from the pipe. When packed with snow, the pink cup served as a mold. Children also combined the pink plastic cup with other items. 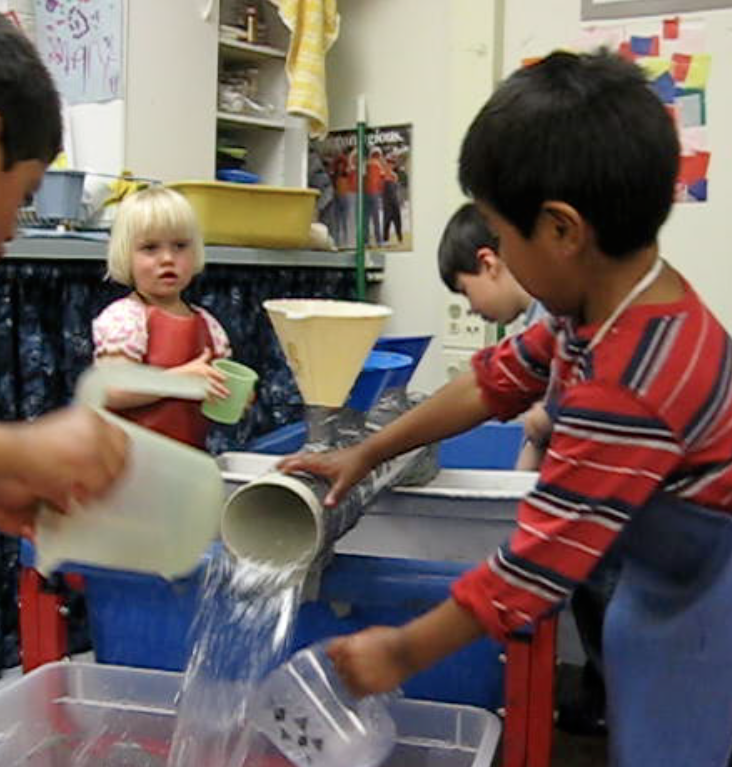 On the left, the child combined it with a funnel to refine the stream of sand he was pouring into the bucket. On the right, the child combined it with a clear plastic tube to fashion a container to hold more sand. One child even asked the scientific question: How would the pink cup roll down a wavy incline? She found out that the waviness of the incline coupled with the structure of the cup (narrower on the bottom than on the top) made for an interesting trajectory. Even when the children were not using the pink plastic cup, it was always at the ready. 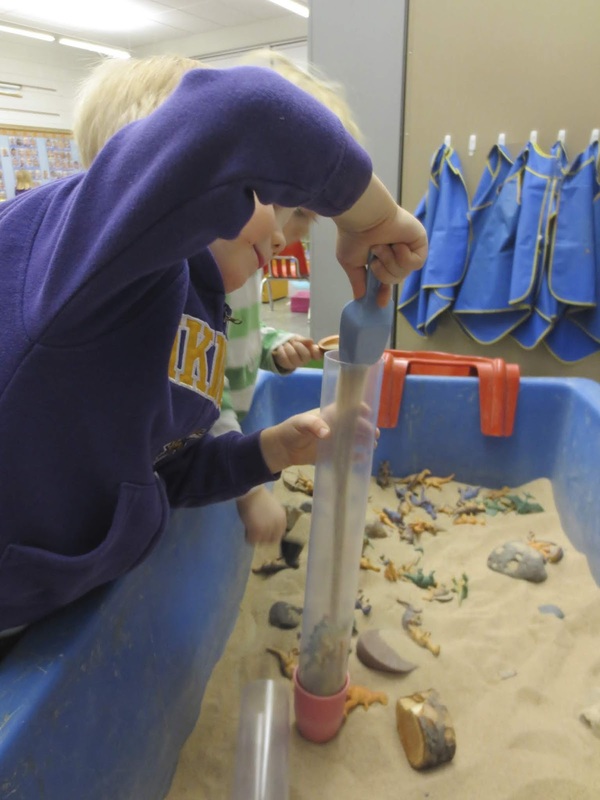 And it did not matter whether the sensory table was filled with sand or water. I am very curious what drew the children to use the pink plastic cup. The cup was worn and heavily used and not particularly pretty. So what was the attraction with this cup? Was it because it was pink and stood out among the other items? Was it because the children could handle it with ease because it fit a child's hand so well? I do know that this ordinary little cup added a richness to play in the sensory table that few---including myself---could have predicted. This lowly cup makes a beautiful case for the the ordinary contributing to the extraordinary in children's play. In his book The Informed Vision, David Hawkins uses the phrase "Messing About" as one of the phases of school work in science. 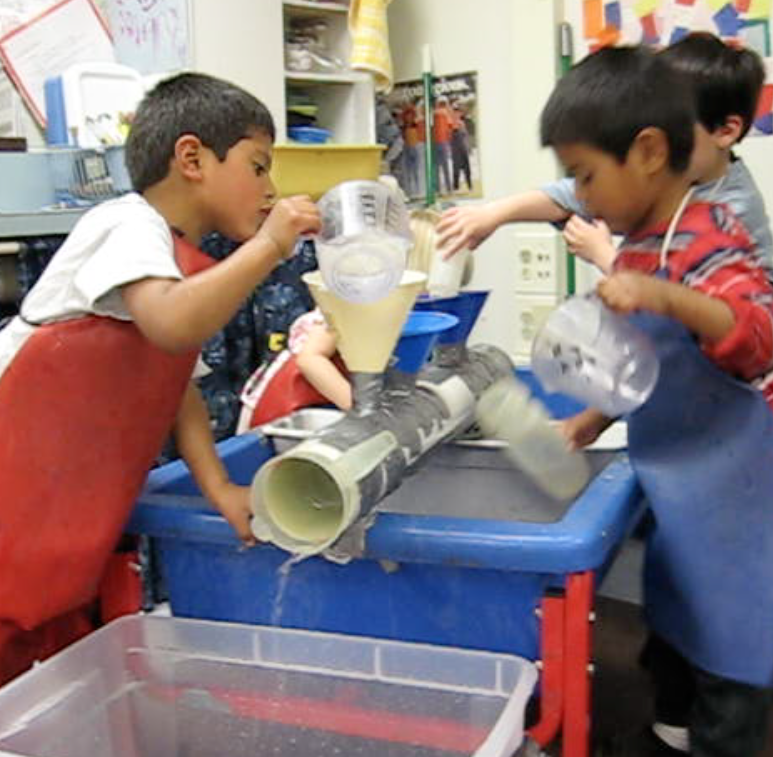 He defines Messing About as follows: "Children are given materials and equipment --- things --- and are allowed to construct, test, probe, and experiment without superimposed questions or instructions" (p. 68). Children in the process of Messing About are natural tool makers. 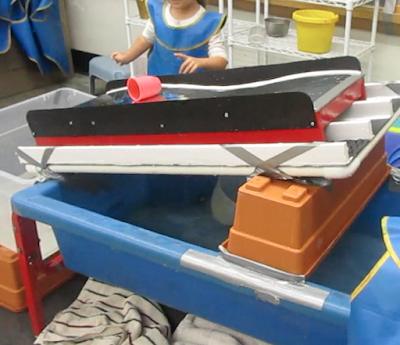 In the following video, a child used a rock to clear the sand off of a small ledge in the sand table. In essence, the child created a rock scraper to complete her chosen task. Rock scraper from Thomas Bedard on Vimeo. It is fascinating to watch the fluid hand motions of the child as she used the rock scraper to try to get as much sand off of the ledge as possible. In the second video, a child created a ramp from a piece of tree bark. He created it by turning the smooth side up and propping it on the lip of the table. He used the tree-bark ramp to test how different rocks slid down the incline. Tree bark ramp from Thomas Bedard on Vimeo. As the first rock slid down the ramp, it hit a little crack at the bottom of the ramp, which caused it to tumble into the table. The second rock he slid down was bigger and the little crack in the bark did not make it tumble and roll into the table. He was intrigued enough with the first two results that he continued experimenting with how other rocks slid down the tree-bark ramp. The child pictured below used a funnel to create a tool to insure that all the sand he poured into the top funnel went into the plastic bottle on the bottom of the tub. An interesting aspect of this exploration was that there was a slight delay from when the he poured sand into the top funnel and when it came out the bottom funnel into the clear plastic bottle. That made it quite challenging to not overfill the bottle. The child pictured below used a pot as a tool to pour water from a plastic measuring cup into a funnel. In essence, the child used the pot to "hold" the handle of the plastic measuring cup instead of actually holding the measuring cup with his hand. Although this may not look like what is normally considered a tool, the pot in this instance became an extension of his hand. One of the most unique uses of a funnel was when a child used one to create a vacuum. In the video below, the child experimented with plunging a funnel into a metal bowl with water. As she did that, she nonchalantly placed her index finger over the hole. And when she did that, air could not escape and the pressure differential caused her to lift water up as she pulled up on the funnel. Creating a vacuum with a funnel from Thomas Bedard on Vimeo. When she tried to push the funnel back into the water, again the air could not escape through the hole so it started to displace the water in the bowl making it hard for her to push the funnel to the bottom of the bowl. Leave it to a three-year-old Messing About to create a vacuum with a funnel. The child in the video below used a clear plastic tube to create a tool to extend his reach. He did that by inserting his hand and arm as far into the tube as possible. With the tube on his hand and arm, he collected some corn from the sensory table. After collecting the corn, he reached through the window in the box to deposit the corn into the hole at the bottom of the box inside. Making a tool to extend the hand from Thomas Bedard on Vimeo. I recently read a story in the January/February 2019 issue of DISCOVER that made me think of this child and his tool. In the article on page 46, scientists were trying to save the northern white rhino from complete extinction. To do that, they had to build a custom probe to harvest a rhino's eggs because they were inaccessible using standard equipment. Can't you just see this child creating such a probe? What came first: Did the children look for some thing to help with their testing or probing or did they find some thing that suggested a path to their testing and probing? Did the children even know they were making tools? What do you think? Here is what Hawkins believes: "Children are in fact playful and eolithic, ... I use the word eolithic in memory of our remoter ancestors who had to start life with objects not intended for any purpose, but who after picking up the stone, for example, invented uses for it. The first invention was not the object --- but the purpose." (p 107 -108). March Madness is in full swing in the USA. The big tournament has begun that will crown a college basketball national champion. As I mentioned in my last post, I set up a basketball hoop in my large muscle area to coincide with March Madness. 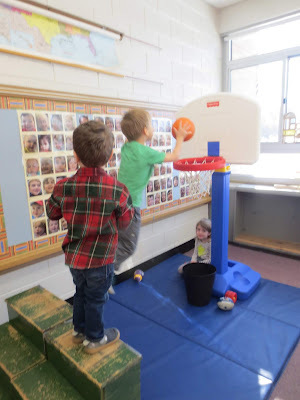 In addition to the basketball hoop, I always added the steps so the children could create their own challenges as they attempted to make a basket. And as the children jumped, I snapped photos of them in mid-flight. I would show them their pictures and offer them the chance to draw themselves jumping to make a basket. Part of the invitation was to hand over my camera so they could use the screen shot for reference when drawing themselves in action. However, the children did not have to climb the steps and jump for me to take an action shot because there were really many ways the children made baskets. For example, some children attempted to make baskets from the mat. 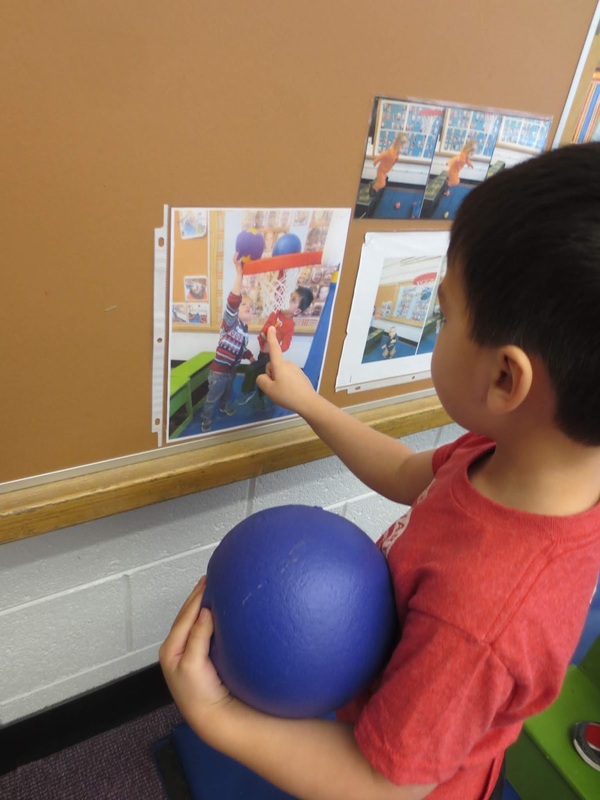 For documentation in the large muscle area, I often posted action shots of the children on the adjacent bulletin board. One of the pictures I displayed was the picture above of the two children on the tippy-toes attempting to dunk the ball. Because I usually kept the basketball hoop up for two or three weeks in a row, the child saw the picture of himself making a basket when he came back the following week. Not only did he see himself making the basket, he noticed how he made the basket. He made the basket by lifting his left leg in the air as he reached up on the toes of his right foot. In the photo above, he looked as if he was studying the picture and recreating part of the action: the lifting of the left leg. He then proceeded to go over to the basketball hoop to duplicate the very same basket from the week before. To me this looked like what happens when people, who are trying to build a certain physical skill set, use stop-action shots to comprehend and evaluate their moves. So often in early childhood education we privilege a certain kind of representation, the kind illustrated by the child drawing himself making a basket. However, by privileging one kind of representation over another, we may not even think to offer invitations for children to use their body as tools to represent their engagement in the world around them. This time of year in the USA, there are a lot of college basketball games on TV, all leading up to a national championship. It is called March Madness. Each year at this time, I made sure I brought out a basketball hoop and placed it on the large muscle mat in my classroom. In addition to the basketball hoop, I commandeered our green steps from the block area and set them up as an invitation for the children to climb as they attempted to make a basket. That added a new level of physical challenge to their act of throwing the ball at the basket. If the child chose to climb the steps, she needed to throw with enough force and the right trajectory while balancing on the 10"-wide step two feet off the ground. 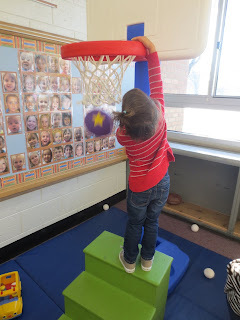 Another way they changed the degree of difficulty was to move the steps closer to the basket. 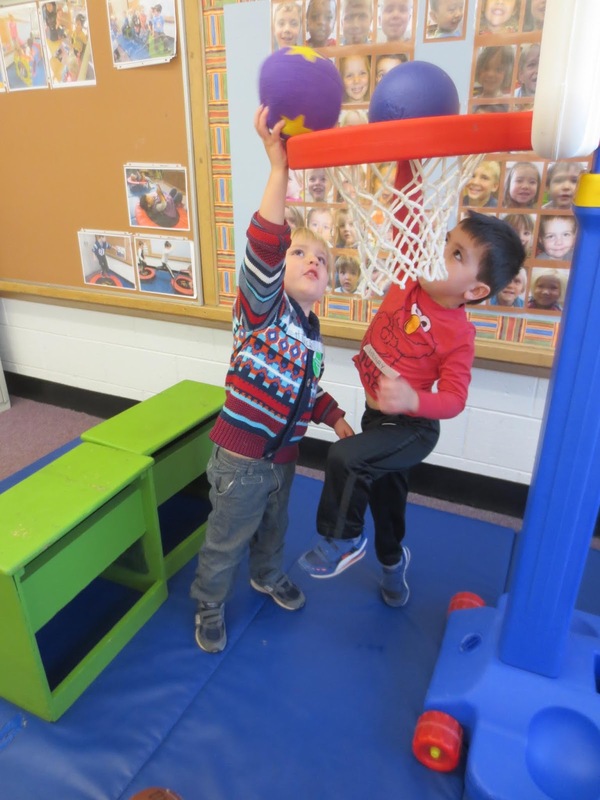 Of course, many children used the steps to create an even greater challenge while trying to make a basket. They asked the question: Can I jump and make a basket? 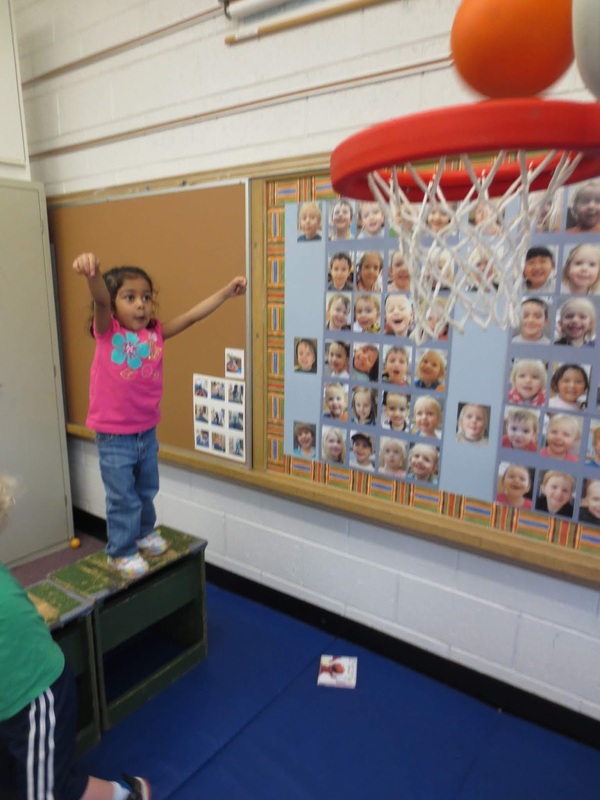 This turned out to be a very complicated action because the child had to compensate the force of her throw in relation to the momentum of her body lunging toward the basket. It was always evident that the children had seen some basketball because they knew how to execute a flying dunk. 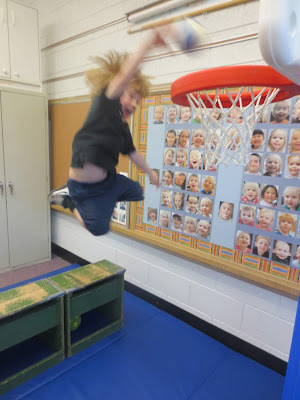 I have almost 1000 of pictures of children in midair as they attempted to make a basket. I often showed the children these pictures. I would usually comment that it looked like they were flying because their feet were not on the steps, nor were they on the ground. The last couple years of teaching, I started to ask children---after seeing themselves in midair---if they would like to draw themselves making a basket. For those who said yes, I suggested we go to the writing table where I gave them the camera with the screen showing their stop-action shot. With the screen as their reference, they gladly tried to recreate their basket-making prowess on paper. The child pictured above at the writing table made the following drawing. When I looked closely at the picture, I saw a lot of detail. He drew the cabinet in back, the red chair, the green steps, the blue mat with its sections, the basketball hoop, and the child on the mat who was watching him make a basket. In his drawing, he even included representations of some of the pictures on the bulletin board next to the large muscle area and one of the florescent lights. He was very proud of his drawing so he went over to the other teacher in the room to tell her about his drawing. The children were always fascinated with these stop-action shots with them in midair. They would ask me time and time again to take another picture and then ask to see it. I am not surprised I took almost 1000 of these images. However, I was genuinely surprised at how willingly the children drew themselves in stop action. Children who rarely used the writing table seemed right at home when it came to drawing themselves in action. Why? I can't help but think that it was because the basketball hoop with the steps was an unique invitation that both the children and I could mine for something richer and more meaningful than simply making baskets. I am spending some time these days going over my digital pictures and videos to tag them. I have over 30,000 images so it is quite a task, but boy is it fun. As I look through the ones that capture play at the sensory table, I think about how an apparatus in the table might affect play and exploration in and around the table. Here is a very simple example of what I am talking about. The example features a couple of play episodes around an apparatus I built back in 2012. I called it a box metropolis. I built the construction over three weeks, adding boxes each week until there were a total of 25 boxes all connected in and around two sensory tables. 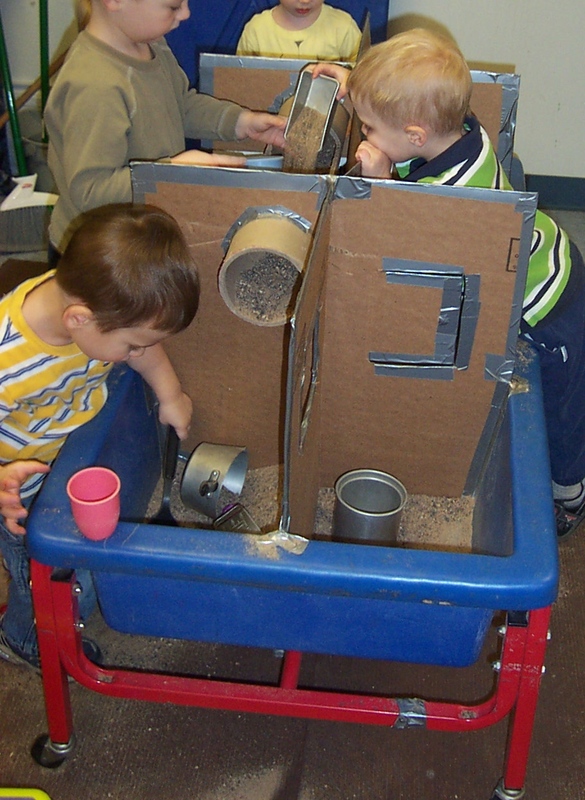 In the first play episode, a child scooped corn from inside one of the boxes. To do that, he had to bend down and lean under and into the box. There is plenty of corn in the open portion of the table, so why did he feel compelled to gather corn from inside that box? By the way, by having to bend over and reach under and into the box, the child is strengthening his core and working on his balance. His feet were slightly spread for balance and his right hand grabbed the lip of the table for even more stability. He was probably working a lot of other muscle groups, too, simply by bending, reaching and scooping and then reversing the process to fill his metal pot. He used a plastic yellow scoop to collect the corn in his metal pot. He did that hands-free because he balanced the pot on the lip of the table. He was able to do that because he also leaned the pot up against the box. The metal pot would have been less stable without the help of the box. How did he figure that out? Was it just trial-and-error? What's interesting was that he balanced the pot using the edge of the box so only a tiny portion of the pot reached in beyond the edge. That also allowed him easy access for pouring the corn into the metal pot. At this point, he exchanged his yellow scoop for a black plastic ladle. He then filled his ladle with corn from the metal pot. Why did he switch utensils? Not only did he switch utensils, but he also moved the pan slightly to the right on the lip of the table. He still used his left hand for scooping. Was that because he was left handed or was it because it made more sense to use his left hand since the pot was on his right side? 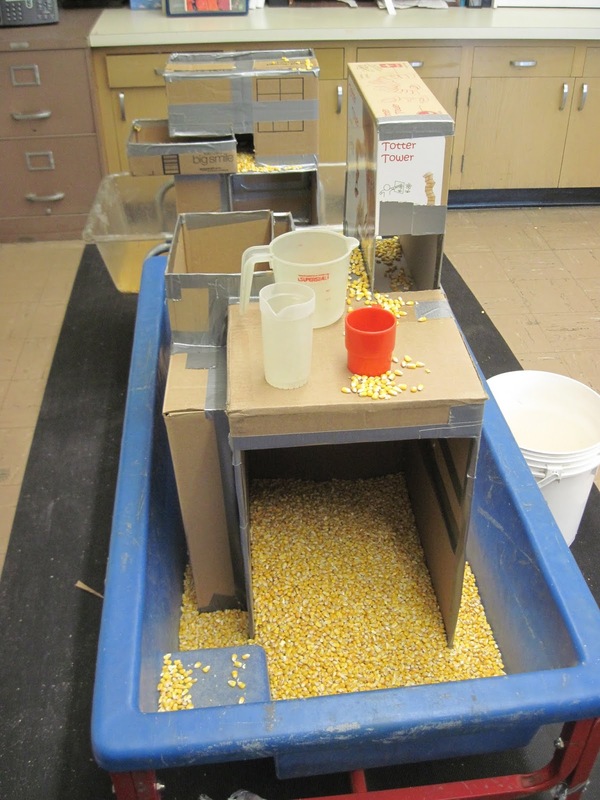 He then used the ladle to put some corn into the narrow opening of another, higher box. For all practical purposes, the only way he could do that was with his left hand. That was not such an easy operation because to get the corn in that hole, he had to lift the ladle up to the height of his shoulder, cross his midline, insert the ladle in the hole and twist his wrist to empty the ladle. The second episode was quite similar. A child on the other side of that same narrow box placed a plastic green cup just inside the box. He put corn into the cup with a long handled spoon, again lifting it from the table to the height of his shoulder. He used his left hand to scoop, but then enlisted the help of his right hand to guide the spoon into the box. Twisting his wrists, he emptied the spoon. Because that was such a narrow opening, some of the corn went into the cup and some not. Making coffee from Thomas Bedard on Vimeo. He said that the box was a machine for making coffee. Was he recreating an experience he had watching an adult make coffee? Did the corn kernels and the sound of them remind him of coffee beans? From these two short episodes, I would have to conclude that the apparatus changed/enhanced play and exploration at the sensory table. Imagine the table without the apparatus. That particular play never would have happened. 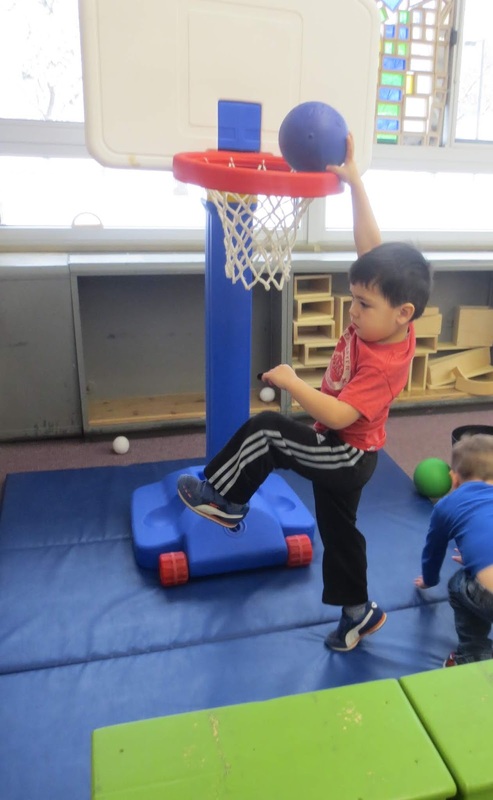 Sure, other play would have happened, but the play potential with the apparatus in the sensory table increases significantly. 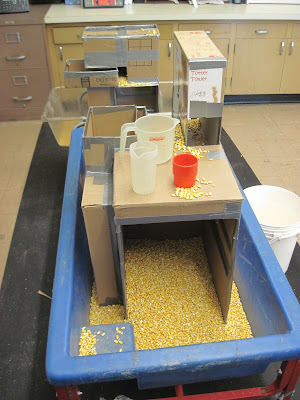 Because there was not one way to play with and explore the apparatus, the children created their own challenges like pouring corn into a hole at shoulder level. 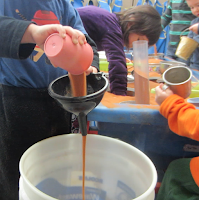 In addition, the fact that the apparatus was open ended allowed the children to bring their own lived experiences, like making coffee, to their play. I am rule-adverse. I never set about making rules when something happened in the classroom that I did not like or when there was a conflict arising from any sort of disagreement. In fact, when I first started teaching back in the mid 70's, I had no rules in my classroom whatsoever. My modus operandi in the classroom could only be described as laissez-faire: a policy of leaving things to take their own course without interfering. I truly believed that children were capable of resolving their own conflicts and life would be rosy in the classroom. Early in that first year of teaching, I experienced a day that was far from rosy. I had a child who said that he wanted to be Oscar the Grouch---and he could emulate him quite well. One day he antagonized every other child in the room to the point that they were all mad at him and were chasing him around the room. In other words, it was utter---and I mean utter---chaos. I have no idea how I got things to calm down. But at the end of the day, the teacher in the adjacent room told me that I had to do something---anything---so that did not happen again. The director also called me into the office and told me the same thing. Little did they know that I had decided that there needed to be a change so there would never be another day like that in my teaching career. Operationally, those rules meant: do not hurt yourself, do not hurt others and do not hurt the materials. As the teacher, if I thought a child was going to hurt themselves or others or the materials, I would step in to stop the activity. I would always use "I" messages like: I can't let you do that because I can't let you hurt yourself or I need you to find something else to do because I am afraid the toy will break. I never sat down with the children to talk about the rules. Instead, we lived the rules. When an issue arose in the classroom, we dealt with it immediately and respectfully. For instance, my Oscar the Grouch friend loved to pick up garbage on our walks. Instead of making a rule about no picking up garbage, I decided one day that we would take a garbage walk. I gave every child a paper bag and told them they could pick up anything they wanted on our daily walk. The next day, I brought out each of their bags so they could each make a garbage collage. The children glued anything they wanted from their bag onto a nice big piece of tag board. The collages were 3D and all masterpieces---from my perspective. However, something very interesting happened: my little friend quit picking up garbage on our walks. And herein lies the beauty of those three rules. They are flexible and can be adapted to any context. For instance, a rule about no hitting would seem to be a no-brainer, right? For me it was not. Since I allowed some play fighting in the room, children did end up hitting each other. When and if children were hitting, then I had to make decisions about intent and degree of force, because intent and degree of force varied with the game and with each of the individuals involved in the game.. If I had a rigid rule, then I would have absolved myself of those decisions. All I would have had to do was enforce the rule. However, by simply enforcing a rigid rule, I would have changed the locus of control from the children themselves to an external rule. As a consequence, the children would be expected to obey the rules. I was not looking for obedience. Rather, I was looking for the children to have the opportunity to internally modulate their behavior by making fine distinctions about the context in which they were operating. Those three rules were all I needed for 35 years of teaching. I think one of the reasons was because, for the most part, life in the classroom was not about rules. Rather it was about creating and co-creating a respectful environment that was based on children's innate curiosity and eagerness to learn and connect with others. A colleague asked me recently if I had ever done a post on the ideal level of water for the water table. My answer was: no. However, that did get me wondering about how I decided how much water to put in the water table. My conclusion was: it depends. But in all cases: enough. What does that mean? Since I do not limit the number of children at the table, there had to be enough water for all to engage in meaningful and sustained play. 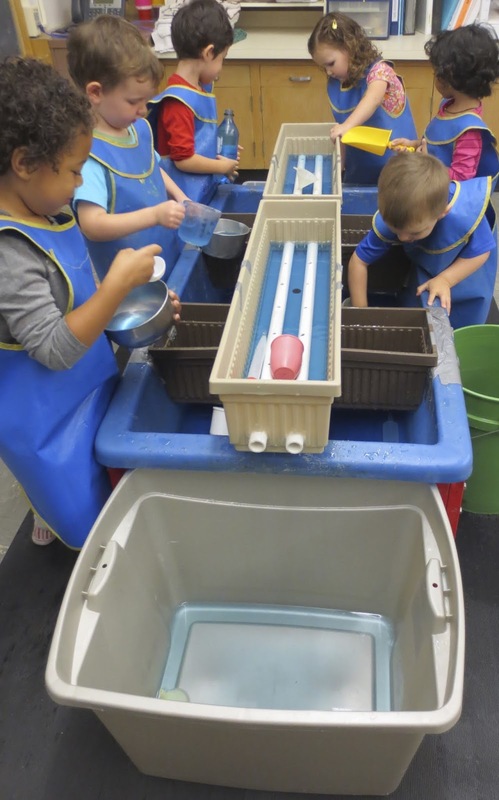 For instance, the nine children pictured below around the water table needed enough water to fill half the table to satisfy their need to play and explore. That was all the more true considering that some of them kept pouring water from the blue sensory table into funnels embedded in the pipe. The pipe then carried the water out of the table into the tub next to the table thus depleting the water in the blue water table. For that reason, I added even more water to the water table. Here was a concrete example of enough water for meaningful and sustained play. The two children in the foreground figured out they could plug the pipe with a plastic measuring cup. Once the pipe was plugged, they could actually fill the pipe with water. That took quite a bit of time and effort and a little help from the other two children at the table. How did they know when the pipe was full? They figured it out themselves: When the water no longer drained through the funnels into the pipe, the pipe was full. Here was another nice example of enough water for meaningful and sustained play. The children set about the task of filling a five-gallon bucket next to the table. 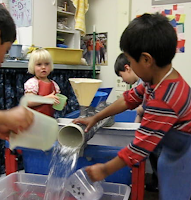 In the video, the water was already inches from the top when a child poured a little more water---carefully and accurately---from a stainless steel bowl into the bucket. As she finished her pour, the child with the spoon declared that it was enough water. The child with the spoon then started to stir the water in the bucket with her spoon. She was soon joined by a child with a little metal measuring cup. They seemed to want to know how vigorously they could stir without spilling. Filling the bucket from Thomas Bedard on Vimeo. Because the bucket was full and there was still water left in both the sensory tables, there was more than five gallons of water to begin with. Without at least that amount of water, the children would not have been able to play with the idea of "what is full and what does that mean for our operations?" However, the amount of water always depended on the setup. For the giant sponge, I used much less than five gallons. I used only as much as the sponge with hold. 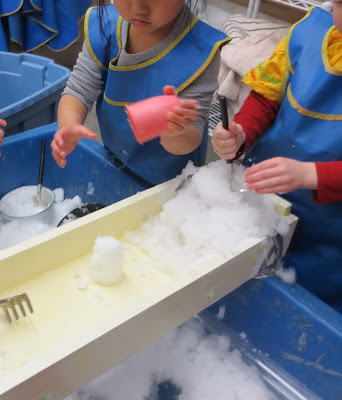 If I used too much water, the sponge began to float in the table and it became hard to squeeze and make suds. Another setup that took very little water was baby washing with a clothesline. An inch or two of water in the table was all that was needed for the children to wash the babies and to wash the clothes. Water beads was another setup that did not need a lot of water because the children's exploration and operations revolved around the water bead themselves. In fact, too much water would have necessarily changed the focus of play. Water beads from Thomas Bedard on Vimeo. There may not have been a need for a lot of water for this setup, but there was a definite need for plenty of water beads for varied and sustained play. There are absolutely other factors that go into deciding how much water to put in the water table. For instance, is the setup inside or outside? If the setup is outside, teachers usually care less about spilling. If the setup is inside, teachers' tolerance for spillage comes into play for making the "how much water" decision. Let me leave you with my answer to my colleague's question. Depending on a your tolerance for messy play and spilling, and depending on the apparatus you set up in the table, and depending how and where you setup your apparatus, use enough water to optimize play and learning. Oh, and it also depends on you knowing the children and other adults you work with. In other words, it depends---and you have to make that decision. By the way, after you make the decision, you can always make another decision about reducing or adding water depending on your observations of the children's play with the original amount of water. P.S. Before all other "depends," is the implicit assumption of who is in control of the play.